Spring time brings beauty to the outdoors, and buyers to the market! For sellers, it's time to bring the beauty inside the home too! Staging your home is a very important way to attract buyers, show them the potential of the home and make a great first impression. Here are some great home staging tips that will help you sell your home before those April showers are over. Declutter. It's hard to say goodbye to things, but try to make a rule that for every new thing that comes into your house, something old leaves. Less is more. Too much furniture can make a space seem small. Place some furniture in storage while showing the house to make the home appear larger to potential buyers. Rearrange. Re-position furniture into cozy conversational arrangements, place pieces to ease the flow of traffic and make the room appear larger. Makeover rooms. Do you have a room that gathers junk to deal with later? Now is the best time to transform the space and add value to the home. Add in a chair, small table, and lamp to a cozy corner for a small reading nook or office area. Show them the light. Lighting sets the mood for the home. To make your home warm and inviting, increase the wattage in lamps and fixtures, aiming for 100 watts to every 50 sq ft. Pick up a paint brush. Pain colors have a big impact on the atmosphere and appearance of a home. 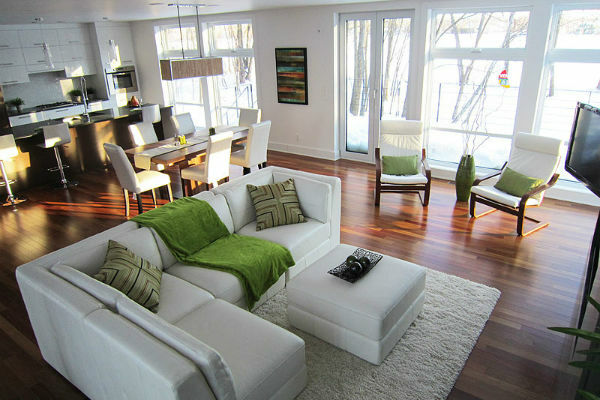 Neutral, warm tones add a sense of comfort; while painting adjacent rooms the same color can make the home feel larger. Wall Art. Get creative with your artwork and where you place it on the walls. Displaying art in a creative way makes the space stand out and shows buyers the potential of the home. The odd couple. When staging accessories, think odd numbers. Three is a magic number, to make things pleasing to the eye and to make the home more inviting. Scale is important as well, to give dimension, add color, shape and texture to the room. Bring the outdoors inside. With all the beauty of spring popping up outside, take a cue and add some flowers and greenery to the inside of the home. It will add another element of cheer and natural beauty to impress the buyer.